York was one of the first cities in the UK to introduce paramedics on bicycles. It was proposed that they could manouver around the York streets of the city centre and get to a casualty quicker than an ambulance. This has proved to be the case and they are worth their weight in gold. Like all jobs though, there is paperwork to be done and this paramedic was catching up with his sitting on the bench in Goodramgate next to the National Trust shop. With the successful introduction of cycling paramedics the police realised that it might be a good idea to follow suit and here we see a pair of policemen on cycles after having loaded an abandoned bike into a transit van. Cycle theft is a problem in York with thieves taking bikes and then later dumping them unlocked around the city. There has also been spates of cycles being stolen and then broken up for spare parts. So far the fire service has not joined in the act of emergency services on cycles. I suppose they couldn't carry enough water on a bike! I don't what they were filming for, but the backdrop of the north end of the Minster would lend good atmosphere. Certainly a nicer piece than the one of Councillor Galloway with the Bootham Bar backdrop threatening the populace with fixed speed cameras that appeared on Look North at lunchtime Thursday! Yet another of York's timber framed buildings, built in 1461 as a college for local priests. Nowadays it is used as a restaurant and conference centre. It is claimed that it has a ghost. It is said to be that of a murderer whose brother was accused wrongfully of his brother’s crime, tried, found guilty and hung. He now paces the corridors with crying in anguish for his brother lost through his own guilt. This is one of the gems of Walmgate built around 1400 it is probably one of the finest examples of a timber framed house in the city. Bowes Morrel House is now owned by York Conservation Trust. This is the section of wall that continues after the gap from Red Tower and takes you to Monk Bar. The road running alongside the walls is known as Jewbury as it was the site of a Jewish cemetry. The central section is marked on the walls with a small inset on the walkway. The section of wall leads you to Monk Bar where there is a small Richard III museum. Along the way you will have a view of the South end of the Minster, unfortunately covered in scaffolding at the moment and also see the archaeology of the east tower of the Roman fort near the Merchant Taylors hall and also you will pass the Ice House as shown in earlier blogs. Fossgate is one of those streets that tends to be overlooked by tourists unless they are heading to the Merchant Adventurers Hall. It is well worth a visit though, this view is from the bridge over the River Foss looking towards the Minster in the background. I will repeat my oft said adage, "look at the buildings above the ground floor level for there is much to see at this second level. Other points of interest along Fossgate include the bridge over the River Foss, The Blue Bicycle Restaurant with a blue bicycle chained to the street sign just outside the restaurant front door and the entrance way to the Merchant Adventurers Hall which is probably a more interesting approach to the building than the one from Piccadily. See my earlier blog on the Blue Bell for details of one of the smallest pubs in York. I will return later to Fossgate to look at McDonalds furniture store (not the Burger chain) and look at the Zik Zak shop and one or two others in this short but intersting street. Note: if you are looking at a Google map of the Fossgate area there is an error in the map showing the location of the river to the South of Merchantgate whereas it is actually located north of Merchantgate. As I am always remarking, when you walk around York lift up your eyes, as the buildings are often more interesting above ground level. 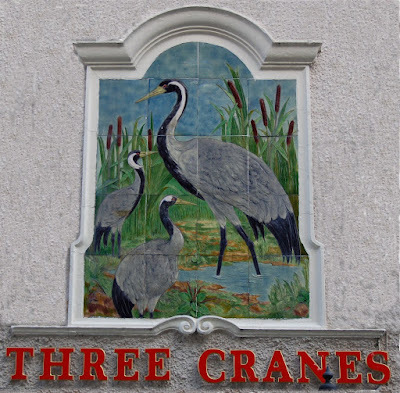 This is the Three Cranes public house in St. Sampsons Square with the amazing painted tiled sign. This may be one of the factors that has stopped the pub from being re-named like a lot of the other pubs in York that have undergone name changes at the whim of some marketing guru who can't leave anything alone. St. Sampsons church is just around the corner from St. Sampsons square on Church Street. It is now used as a centre for over sixties to drop in for a snack and cup of tea. Now that I have reached that magic age I am now eligible to go in! This is the view along Foss Islands Road looking towards the old County Hospital and Foss Islands junction. On the left of the picture the willow trees are where the King's Fishpool use to be. On the right where Halfords and Staples now stand, there used to be a power station with a cooling tower across the road behind the willow trees. Access to the cooling tower was via the blue bridge in the middle distance. At this point the river flows round a bend to the left of the picture towards a block of apartments known as Rowntree Wharf. The building was at one time a flour mill and then became a warehouse used by Rowntree for storage of ingredients like sugar, cocoa butter and oils and fats used in the manufacture of confectionery. This section of river also marks a gap in the city walls between Red Tower and the corner of Jewbury. Defences were provided by the marshy ground in the area. The ruins of St. Mary's Abbey a former Benedictine establishment can be found in the Museum Gardens. When Henry VIII was doing his dissolution of the monastries thing the abbey was reduced to the ruin that you see today. Other interesting buildings within the Museum Gardens include St. Leonards Hospitium (ruin), St. Mary's Hospitium a functional building, the Yorkshire Museum, Tempest Anderson Hall and an Astronomic observatory owned by the Yorkshire Philosophical Society. The Mansion House is the official home of the Mayor of York and is situated at the top end of Coney Street the main shopping street and faces out on to St Helen's square. Facing diagonally across the square is Stonegate, so called because that was the street that stone for the Minster was hauled along from the riverside where the Guildhall stands. The Red Tower can be found on Foss Islands Road next to the walls. It stands next to what was at one time swampy ground known as the King's Fishpool. The modern DEFRA building at the junction of Foss Islands and Peaseholme green has the address of King's Pool. Being built of red brick the tower contrasts with the pale stone of the walls. This popular tourist street with picturesques overhanging second stories in York was once the street of butchers. This is the origin of the word shambles, having come from the Anglo Saxon "fleshamells" becoming shamells and eventually shambles. Before modern sanitary practices the street would have been littered with offal and flowing with blood from slaughtered animals. Nowadays it is much more picturesque with souvenier shops, jewellers, restaurants and a shoe and leather repair shop. The butchers have all long since departed except for one that remains just off the Shambles in Little Shambles leading into Newgate Market. The photograph is as many tourists would not see it, having been taken after most tourists have gone home but before those that are staying overnight have joined one of the many ghost walks. Snickleways is a term invented by Mark W Jones a former Rowntree board director in his book "Walk Around The Snickleways of York". It is a combination of the York dialect word "snicket" and alleyways. Above and below are examples of some of the "snickleways" you will find in York. Top picture is the passageway from Goodramgate into Bedern, below it is the link from Petergate to Swinegate and at the bottom of the page is the link from St. Sampson's Square to Swinegate. There is another passage that runs almost parallel linking to Little Stonegate called Nether Hornpot Lane. At the time that the book became popular the "Anglers Arms" in Goodramgate changed it's name to the "Snickleways Inn". There are numerous passages like these in York making the book a worthwhile purchase if you are coming to York for a visit. King's Square is a pleasant leafy square in the centre of York located close to the Shambles and is ideal if you want to park your weary bones for a short rest. There are often various vendor stalls around the edge of the square like the ice cream and lemonade stalls in the second photo. It is also a popular square with street performers. The square is the site of an old church and some of the slabs on the raised section are memorial stones where the inscription is still readable. Watch out for the cat on the roof of the estate agent. Local architect Tom Adams has them as a signature to buildings he has worked on. There is also a cat stalking up the wall of Barnitt's hardware store next to the square in Colliergate. For more on the cats visit "Cats in YorK" website. On Monday evening I would normally have been out with this bunch of hobbdehoys and ne'r do wells, joining in the dancing. However, because I had badly strained my calf muscle on my left leg I took my camera down instead and took several photos. To see further photos of the evening use this link. 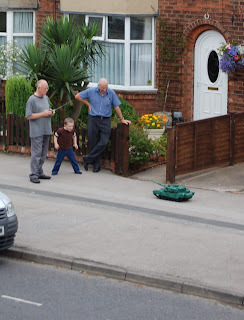 Who is having more fun, the young lad or the Grandads? Photo taken earlier this afternoon from my bedroom window. The National Trust looks after a number of heritage sites throughout the UK. The sites include old buildings, gardens, woodlands and moorland. It is run by volunteers and many of the houses have a staff of volunteer guides to give you information about the history of a house you are visiting. The Trust is run independent of the Government and as such needs to raise revenue to maintain buildings. This delightful looking shop in Goodramgate sells a number of National Trust items for this purpose. The nearest National Trust property to this shop is the Treasurer's House which you can find just around the corner to the right when you walk towards the Minster. it was changed later into its present name. York Civic Trust was set up to keep York a special place for residents and visitors alike. Just to the right of the plaque is an alleyway leading to the Shambles (more on that in a later post). The building with the white shop front is a letting agency with address of one and a half Whip-Ma-Whop-Gate. Gate is derived from the Norse word for street and the gates in the city walls are known as Bars. Can be quite confusing for a visitor if you tell them you are taking them on a tour of the York Bars and they end up walking round the walls without stopping for a drink! Views of the tower at the end of Marygate. 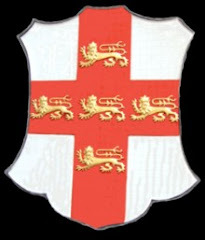 Although York does suffer a little bit from flooding it is usually only properties near to the river that are affected. There are flood defence walls with sealable gates. In the bottom photograph the red brick wall where you can see a car has a gate that is raised when the water becomes a threat and keeps the properties behind the wall safe. York's two most popular attractions are probably York Minster and the National Railway museum. This little road train runs between the two attractions and is seen here crossing the River Ouse on Lendal Bridge. Jump on and pay to be transported between the two points. It has to be said though, that you do miss a pleasant walk between the two except for the bit walking in the tunnell under the railway lines which is damp, smelly and littered with pigeon droppings most of the time. Once out of the smelly tunnell you pass the memorial gardens, go through the arch of the city walls, cross the river, pass the entrance to the Museum Gardens, pass the library, get a glimpse of the Theatre Royal and the curve of the council offices in St Leonards with The Minster providing a dominant backdrop along Deangate. All in all a pleasant little walk and you get time to linger over some of the sights I have mentioned rather than being whisked along in the road train which takes the same route. This church is one of the off the beaten path little gems that is well worth a visit. If you are staying at the Park Inn next to the river try and take the time to cross the road and visit this church. Inside you will find stained glass of a superb quality that is a similar age to the mediaeval glass in York Minster. North Street runs paralell with the river between Ouse bridge and Lendal Bridge. Probably one of the tattiest areas within the walls is now being redeveloped. Most of the buildings in this area have been demolished now with the exception of the ambulance station, the homeless shelter and the York Bedding Company. Negotiations are ongoing with the Bedding Company, but no agreement has been reached on a purchase price for the site and the council are having to consider using compulsory purchase powers. They might do well to remember the bloody nose they got when they wanted to demolish Gillygate in the late 1960s to develop a new inner ring road and having purchased most of the properties one bed and breakfast house owner refused to sell and was threatened with compulsory purchase. Gillygate is still standing and the useless inner ring road that would have blighted the interesting Gillygate which has some listed buildings and demolished parkland at Bootham hospital. Having aquired most of the other buildings, demolition has proceeded around the York Bedding Company, shown above and as is usual in a historic city like York, the archaeologists have moved in to excavate the site. Convenient view holes have been left in the fencing so the curious can see the work of the archaeologists as they dig holes with paintbrushes. The other day it looked like the market had overflowed into Parliament Street which seemed strange for a Monday as it is usually a quiet day for the market. However, when I went through to the market area there were no stalls set up in the market area. The reason can be seen in the next photograph. The strange looking machine in this photo is a treadle sewing machine being used to make name plates. Canopies of the stalls were being removed and cleaned and the paving flags were getting a high pressure water jet cleaning.